'Chitralahari' is likely to be the comeback film of Sai Dharam Tej. Movie Buffs are looking forward to watching this entertaining love story after the trailer launch. Makers will be unveiling 'Glassmates' Song composed by Devi Sri Prasad at 7 pm in Sequel Resorts, Khammam. 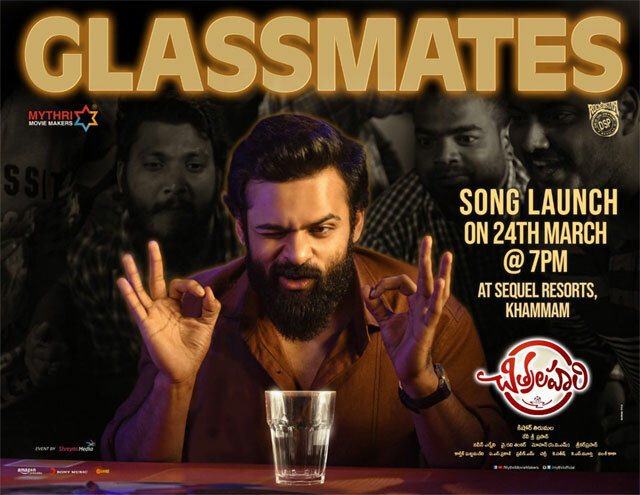 In the Announcement Poster, Sai Dharam Tej offered a kirrak expression while sitting before a glass tumbler placed on the table. Wasn't it like promoting Jana Sena Party? All the supporters of Pawan Kalyan will thoroughly enjoy this particular song. Already, 'Parugu Parugu' song has become an instant hit. Now, People will look forward to 'Glassmates' song scheduled to release on March 24th.